I’m always looking for quick and easy meals during the week and this is perfect! I used Pillsbury’s pizza crust, but want to try it with Trader Joe’s whole wheat pizza crust. Preheat oven to 400 degrees. Line a large baking sheet with foil. Divide dough into 4 pieces. On a lightly floured work surface, stretch out each piece into a 3 by 4 inch oval then stretch to a 6 by 8 inch oval. Steam broccoli for 2 minutes to partially cook. Drain to remove any water from the steaming process. Dividing evenly, scatter the broccoli over dough, leaving a 1/2 inch boarder. Sprinkle with garlic and season with salt and pepper. 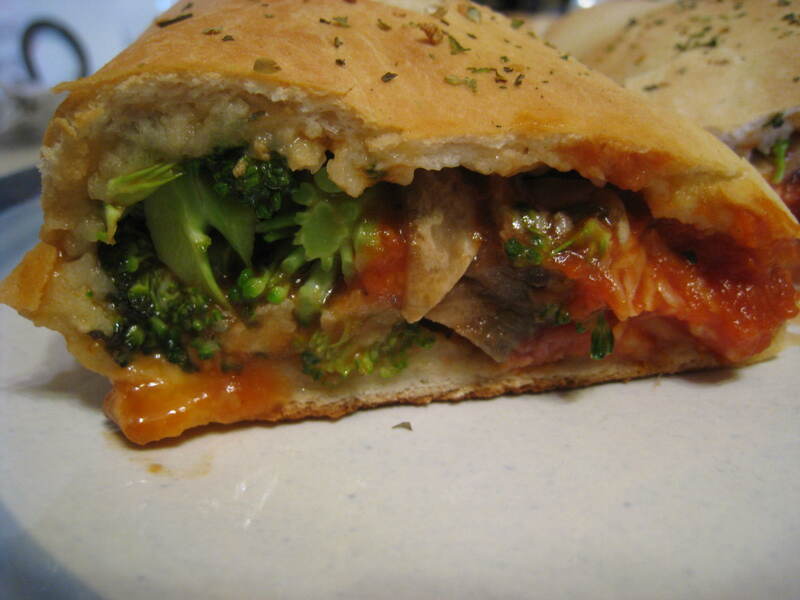 Divide the mozzarella, salami and pizza sauce evenly over the 4 strombolis. Starting at the shorter end, roll up each stromboli and place seam side down on the baking sheet. Using the top of a paring knife, cut two slits into the top of each. Spray the tops lightly with cooking spray and sprinkle with pizza seasoning. Bake until golden brown – baking times depend on the type of dough being used. For the Pillsbury dough I used, it was about 15 minutes; fresh pizza dough will probably take about 25-30 minutes.